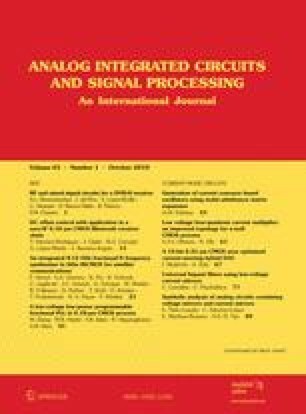 A new circuit topology of first-order voltage-mode all-pass filter providing high-input and low-output impedances is described. The filter consists of only one grounded capacitor and one active element, namely VD-DIBA (Voltage Differencing-Differential Input Buffered Amplifier), with the possibility of electronically tuning the natural frequency. The filter is assembled from commercial integrated circuits, and the frequency responses measured are compared with the theoretical characteristics. Research described in the paper was supported by the Czech Grant Agency under grants Nos. 102/08/0581, 102/09/1628, and by the research programmes of BUT No. MSM0021630503 and UD Brno No. MO FVT0000403, Czech Republic. OPA860—Wide Bandwidth Operational Transconductance Amplifier (OTA) and Buffer. Texas Instruments, SBOS331C-June 2005-Revised August 2008, www.ti.com. AD8129/AD8130. (2005). Low cost 270 MHz differential receiver amplifiers. Analog Devices, Review C, www.analog.com.